This pest repeller is great for use indoors because it can penetrate walls and has a large range. 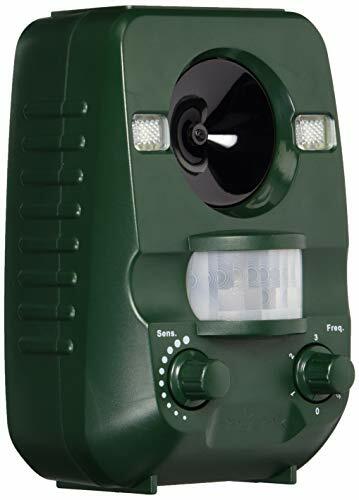 This ultrasonic pest repellent has a large range of 1800 square feet and is effective at repelling mice quickly. This solar powered repeller is incredibly effective when used outside at the perimeter of the home. If you are not in favor of trapping or killing the rodents in your home, other options are just as effective at keeping them away. Repellents work great because you do not have to deal with cleaning up after the traps or worrying about a pet or child getting into the bait you put down. In this article, you’ll see that we’ve reviewed the best mouse repellents that you can use in your home. These won’t harm the environment, they are clean and simple to use, and there’s no messy cleanup. Why Should You Use Mice Repellents? 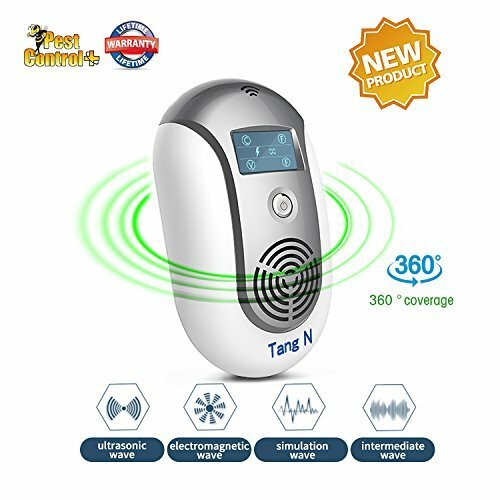 This repeller is new in 2018 and comes with an easy to use display and uses a combination of ultrasonic and electromagnetic waves to scare off rodents throughout the home. Because of this design, the repeller can ward off pests through walls and even to the exterior of the home. This pest repeller is incredibly easy to use because all you have to do is plug it in and turn it on. The device starts working immediately once it turned on. One great thing about this one is that you do not need to play around with the frequencies or anything like that. 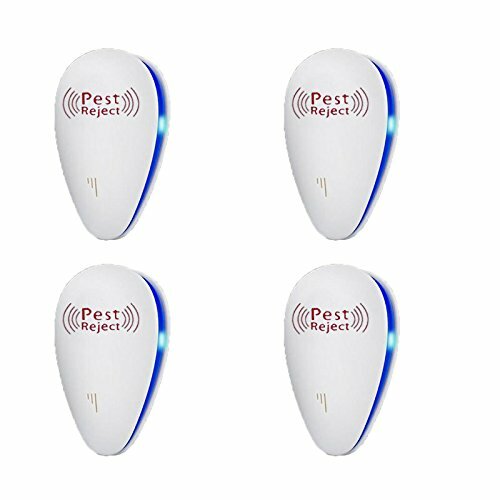 The device will choose the right frequency to repel the pests away from your home. The smart chip inside the repeller sends a frequency out that only rodents, squirrels, spiders, fleas, ticks, ants, and other small pests can hear. It is safe for family pets. The manufacturer also offers a 100% lifetime warranty. If this repeller does not work in two weeks to get all the pests out of your home, they will give you a full refund. Manufacturer recommends one in each room even though the range is 1800 square feet. Doing that could become pricey. This repeller comes with dual ultrasonic and electromagnetic waves to provide a thorough output that gets rid of a variety of pests inside and outside your home. The company claims to have the most potent electric repeller on the market, and it is safe around children and pets. The device covers up to 1800 square feet with one unit. This repeller works to get rid of mice, flies, hornets, crickets, ladybugs, termites, moths, gnats, spiders, and bed bugs. The manufacturer also warns that once you plug it in you may notice a slight increase in pests for a week because they will be trying to escape the home and get outside. They recommend using the device for at least 3-4 weeks before making a judgment on its effectiveness. This is an upgraded version of their previous unit. This solar powered repeller is used to repel away intruder animals such as dogs, squirrels, raccoons, mice, etc. The device sends out an ultrasonic wave as well as flashing LED lights. The repeller has a motion sensor so it can detect when an intruder is in range. Once it does, it will start emitting the frequency and flashing its lights. The device is solar powered and is completely harmless to humans and the environment. The motion sensor detects up to 29.5 feet away and can work up to 900 square feet of unobstructed area. In addition to it being solar powered if you lack sunlight you can also plug it into a USB and charge the rechargeable batteries inside. The device is simple to use–you insert it into the ground or mount it on the side of your house, and it’s also waterproof, so it works great outdoors. The manufacturer also offers a 12-month warranty if anything goes wrong. This all-natural spray is entirely organic and is made to repel mice from inside and outside your home. The spray contains a blend of essential oils that the mice do not like being around but is pleasant for humans. The smell is not overpowering and blends in nicely to a room. The spray contains no harsh chemicals or poisons, so it keeps the mice away without causing a messy cleanup or causing the mice to die. This works on all types of mice including field mice, house mice, deer mice, and all kinds of rats as well. The manufacturer offers a 100% money back guarantee on this, so if you do not like it after 60-days, they will refund your money. Victor is one of the top brands for rodent removal. With their wide range of products, keeping mice out of your house should be no problem. 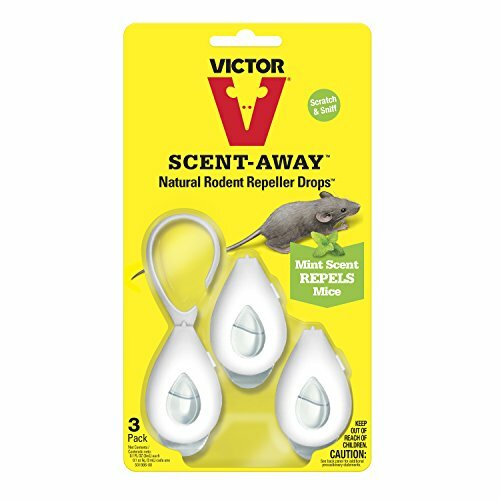 To protect the perimeter of your home, use Victor Mouse-A-Way mouse repellent pellets. 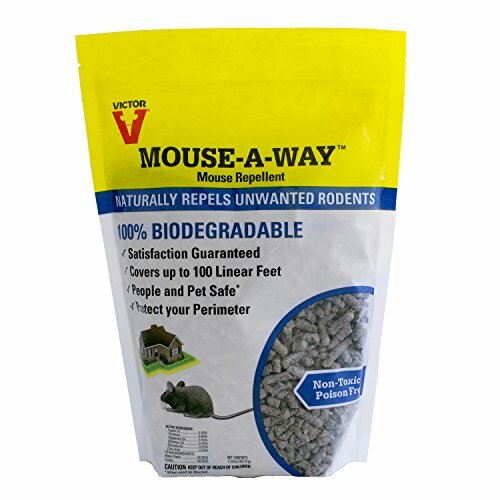 One 1.75 pound bag covers up to 100 linear feet and drives rodents away with its 100% biodegradable pellets. They are made from a natural, non-toxic and poison-free formula infused with mouse repelling essential oils. These pellets are safe to use around humans and pets so that you can naturally repel unwanted rodents. These pellets are easy to use. All that’s needed is to spread the pellets in a band around the perimeter what is from one to three inches wide. The thicker the band, the more effective your repellent will be. Since the pellets are all natural they will disintegrate approximately ever two to three weeks, sooner if you are experiencing excessive rain. These repellent drops keep mice away by using a scent that the mice do not like. The primary product used in this is peppermint oil. This is a great way to keep mice away in smaller enclosed spaces like crawl spaces, closets, and small bathrooms. This product is also a cleaner and more humane method than using traps and baits. You can place these drops anywhere, and they should repel all types of rodents for up to 60 days. Mice breed very quickly so once they get into your home and find a comfortable place to nest you could face a severe infestation. Rodents are also very smart and can see their ways in and out of a lot of situations, so that is why traps and bait are not always the most effective method for keeping them out of your home. Because of their wit, it might be best not to do something that is going to prevent them from ever getting into your house in the first place. This is where repellents become useful. Some sprays that contain peppermint or cinnamon are effective at keeping mice away from plants and gardens. Over time these sprays do lose their effectiveness because the mice will learn to deal with the scent if it means they get to eat and have shelter. When it comes to ultrasonic repellers, these are also very effective as a short-term method but also have a similar downside to the spray. When the mice get to the point where they have no other option but to deal with the sound–they will. The only 100% sure way to keep mice out is to ensure you are not leaving any access points open. Check the foundation to make sure there are no cracks, ensure there are no pipes they could be accessing, and close everything up once you have repelled all the mice out of your home. The only 100% sure way to keep mice out is to ensure you are not leaving any access points open. Some repellers will say that they are ultrasonic and can cover square footage of up to 2000. That may be true, but it only works if its 2000 square feet with no walls (unless your outside, I doubt you have a space that big).Electromagnetic can penetrate through walls and cover a right 2000 square feet inside a home. If you are using peppermint oil and cinnamon spray to keep mice off your plants you have to reapply it twice a day to ensure they stay away. These are also only effective in the short-term. After a while, the mice will no longer be bothered by the scent, so you need to switch to another kind of smell. Even though advertisements say the waves are safe around cats and dogs-that is not always true for other pets. Lizards, birds, ferrets, guinea pigs, and fish could become stunned by the sound and even die if you do not realize it’s bothering them. Sometimes you may not even know it’s bothering them. It’s best to contact the manufacturer about it or do some of your research on the type of pet you have before using a mouse repeller. If you have been successful at repelling the mice from your home, you want to close up any possible access points they may have of getting back in. When the strength of the repellent wears off, and they go to come back in–you want to make sure you’ve closed off your home. If you repel all the mice out of your home and seal up any entry points to keep them out, you won’t have to worry about dealing with mice ever again.